Who’s My Thirteenth-Great-Grand Baby Daddy? William Shakespeare NOT. And as I don’t have a baby, per se (my dearest Kitten Children, please cover your wee little ears – you know I love you much more than one with a full deck would define as seemly), the question was never germane. Here’s the situation: For three entire days now I was under the mistaken impression that William “Yo – THE BARD” Shakespeare was my twelfth great-grandfather (ah – Twelfth Night, twelfth grandfather). I was CHUFFED, as those Northern Brits like to say; I was thrilled right down to my little pink toes. I LOVE Shakespeare – I’ve taught Shakespeare, I’ve performed Shakespeare, I’ve read Shakespeare since I was in grade school, and YES – I thought I knew a thing or two about Shakespeare. Damn computer genealogical tools. They appended “John Hall” as son to “John Hall” – who just happened to be the physician spouse of no other than Susanna Shakespeare. I knew Shakespeare’s oldest surviving child was Susanna. I knew his son Hamnet had died. The time period was correct, the name made sense, I just didn’t notice that the “son” John Hall (my actual kin) was born in Connecticut. Oops. Now I know that Shakespeare’s children failed miserably at providing him with bouncing baby grandchildren – even unbouncy ones for that matter. Hamnet had a twin named Judith. She and her spouse had three children, none of whom married. Susanna and John had a daughter named Elizabeth (born, I believe, AFTER Shakespeare died). She was married twice and never had a child. So that’s that for William Shakespeare’s lineage. Dead and gone. I SHOULD HAVE KNOWN. If there had been a documented bloodline you know that people would have been shouting about it from the rooftops and trying to get a piece of the merchandising action. I would have certainly prattled on excitedly all about it (hold your tongues). I could still name drop, I suppose, but I don’t feel like it now. I’m filled with a serious case of “bardic ennui.” Royalty-Scmoyalty. Like I’ve always joked, I have a passel of ancestors of “high” birth who no doubt oppressed and or killed or dispossessed the throng of the ancestors of “low” position. It’s a laugh riot. I located my important founding Mennonites in Pennsylvania and a direct relation from the Mayflower (my tenth great-grandfather – evidently he and his brother were Governors of Plymouth Colony at different times). I guess I could ponder the ramifications of that influx of these settlers on the Native population. Huzzah! Oh well. Back to figuring out who perished of the Black Death and who survived it. Pretty festive. 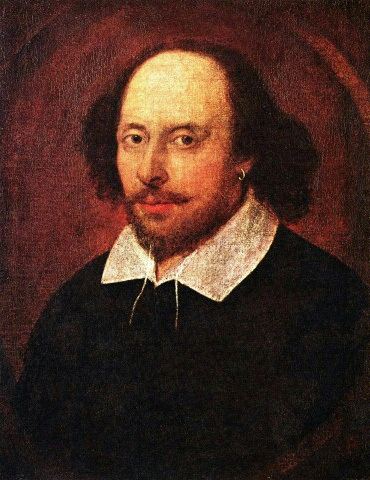 Is that an earring in Mr. Shakespeare’s ear??? Don’t fret so much, Kate. It is still entirely possible you are of Shakespearian blood. Maybe, just maybe Mr. William had an affair with your Great Great Great Great Great Great Great Great Great Great Great Great Grandmother. It is only by means of extramarital infidelity that we can explain the American Indian blood in our veins. That’s a great thought. There’s already plenty of documented infidelity in my family tree. And just because Judith’s three children never married doesn’t mean that they didn’t participate in Elizabethan (or James-ian?) frolicking resulting in progeny somehow related to ME.